A team of researchers using data from ESA's XMM-Newton X-ray space observatory, NASA's Chandra X-ray Observatory and NASA's Swift X-Ray Telescope has found evidence for the existence of an intermediate-mass black hole (IMBH). Scientists have strong evidence for the existence of stellar black holes, which are typically five to 30 times as massive as the Sun. They have also discovered that supermassive black holes with masses as large as billions of Suns exist in the centers of most galaxies. They have long been searching for IMBHs that would exist in between these two extremes, which would contain thousands of solar masses. Thought to be seeds that will eventually grow to become supermassive, IMBHs are especially elusive, and thus very few robust candidates have ever been found. One of the few methods scientists can use to try to find an IMBH is to wait for a star to pass close to it and become disrupted. 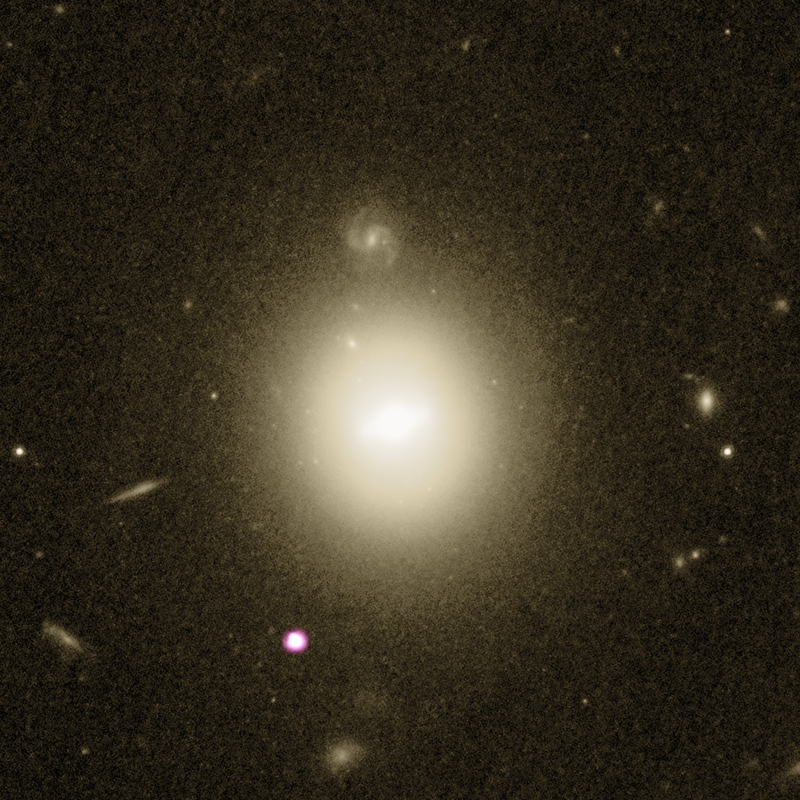 This event causes the black hole to emit a flare that can be observed by telescopes like Chandra. Previously, this kind of event has only been clearly seen at the center of a galaxy before, not at the outer edges. In this new study led by Dacheng Lin of the University of New Hampshire, scientists identified a possible IMBH in observations of a large galaxy some 740 million light years away. 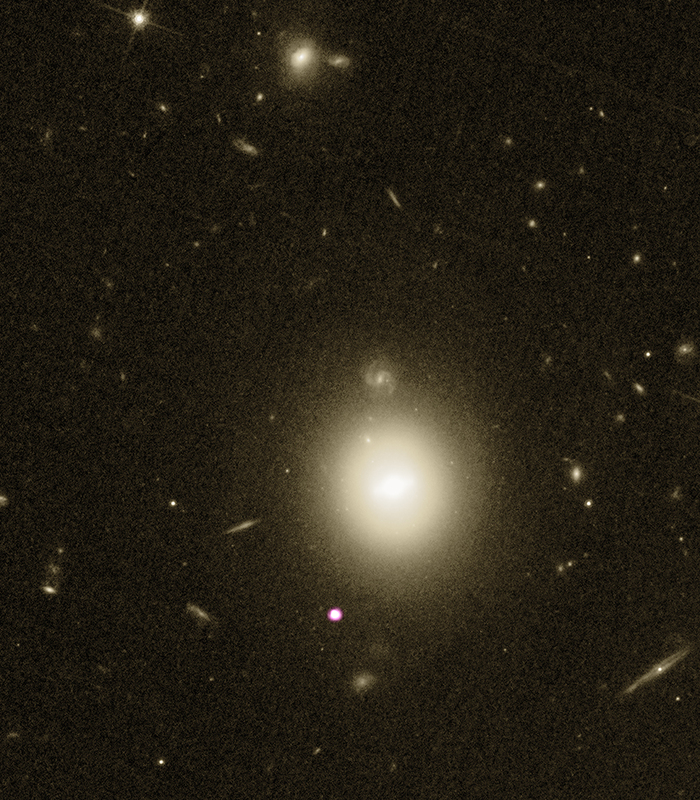 The image above shows the galaxy named 6dFGS gJ215022.2-055059 in data from NASA's Hubble Space Telescope (yellow), with the X-ray source inferred to contain the IMBH detected by Chandra (purple) on the outskirts. In the panel below, X-ray data from XMM-Newton over two epochs shows how the candidate IMBH brightens over time. Given this and other observed properties, the researchers concluded that this X-ray source represents a star that was disrupted and torn apart by a black hole with a mass of around fifty thousand times that of the Sun. Such star-triggered outbursts are expected to only happen rarely from this type of black hole, so this discovery suggests that there could be many more such black holes lurking in a dormant state in galaxy peripheries across the local Universe. In addition to telescopes mentioned above, this study, which appears online in Nature Astronomy on June 18, 2018 (and available here), used data from the Canada-France-Hawaii Telescope, the NASA/ESA Hubble Space Telescope, NAOJ's Subaru Telescope, the Southern Astrophysical Research (SOAR) Telescope, and the Gemini Observatory. Coordinates (J2000) RA 21h 50m 22.5s | Dec -5° 51´ 08.2"
A black hole tearing apart a star. About 740 million light years from Earth. X-rays from the Chandra X-ray Observatory and optical light from the Hubble Space Telescope. About 129,000 light years across. X-ray is purple, optical is gold.